The finger picking technique can be played several different ways. You can use only your fingers to pluck the strings. Many pickers will use a thumb pick for the bass notes and then pluck the treble notes with their index, ring, and middle finger. To expand on the thumb pick there are also many players will use plastic or metal finger picks on the index ring and middle fingers. I would recommend doing whatever is most comfortable to you. It’s a good rule to use your thumb to hit the bass notes, that will be the Low E, A, and sometimes D. and your index for the G string (sometimes the D), your middle finger for the B string and, ring finger for the E string. This is not set in stone. Travis picking a good technique to get started with finger picking and can really add a dynamic element to your playing. This lesson is an introduction to Travis picking, there are many different styles and techniques to that have been added and also called Travis picking. This lesson we will pick a party three different chords, the G chord, The C chord and the D chords. I chose these chords as they have root notes on different bass strings. After you have learned the different patterns, you can then apply them to other chords. For example a G chord pattern could be applied to an E or F chord with little trouble. In our first example we will be looking at the C chord. In this example we will only be playing the bass notes. The thumb will need to be able to play these quarter notes with a steady beat before we can add any treble notes. In this example we keep our bass notes but add a pinch of two notes at the same time on our first beat on the 2nd and 6th strings. Next we are going to continue to build off of example 2 and add some additional treble notes using our middle finger. Remember it’s important to keep the bass notes with a steady beat. If you have trouble just slow down and really concentrate. Congratulations, you have just learned the most common Travis pick technique on a chord with the root note on the A string. Let’s take a look at some other examples on other chords. In this example we are returning to the bass notes using the G chord. Just like in example 1. Make sure you keep a nice steady quarter note beat. Once again we are adding a pinch to the bass notes. Just like in example three were adding more treble notes. Now with the D chord were hitting the bass notes again. We are hitting the open D string and rather than hitting a higher note we are going to play the open A note. This may be a little awkward at first. Our next example we are adding the pinch to our bass notes like in the previous lessons. 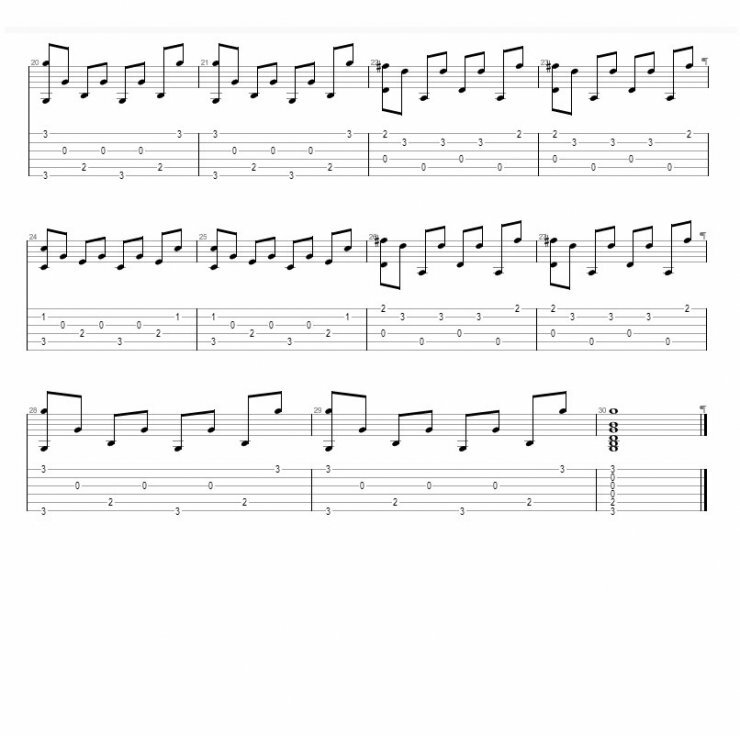 This example again has the full Travis pick part, with bass notes, pinch and treble notes. This is a simple little exercise I put together to wrap up examples 3, 6, and 9. When you’re playing this make sure your chord changes are nice and even. Yeah I know what you mean and when I was putting this together I was debating my self on if I should go that approach or not. Maybe I'll expand on this or even create a part 2 sometime. I've had so much fun with Travis picking the last few days. Good lesson! I as you say, its so fun to play with travis picking. I am just learning the Mr Sandman by Chet Atkins. It also contains some nice Travis picking. It just gives more of a beat to it! haha. Keep up the good work! A good travis picking song is Dust In The Wind... that is a great beginner test to Travis Picking. Thats cool. I didn't even know dust in the wind was travis picking, so I guess I have a head start. i'm more a Travis picker than anything else(Ac+ Elec) and seem to have, over the last 33 or so years of playing, turned my right hand into that strange crab-creature in those Bill Frisell close-up Vids. and on the elec i've begun to favor the neck 90%.. odd the way things change. i tell my students , as i kinda told you/y'all, that i travid pick --but after re-visiting True and Pure Travis Picking again through the above (very fun!) set of exercises and such, i'm wondering just what kinda 'picking style' my playing falls under, lol, if any. or just "old dude can't decide Picking"
thats some really advanced notation. Paul McCartney's "Blackbird" is a really excellent song to learn for those who enjoy this picking style.